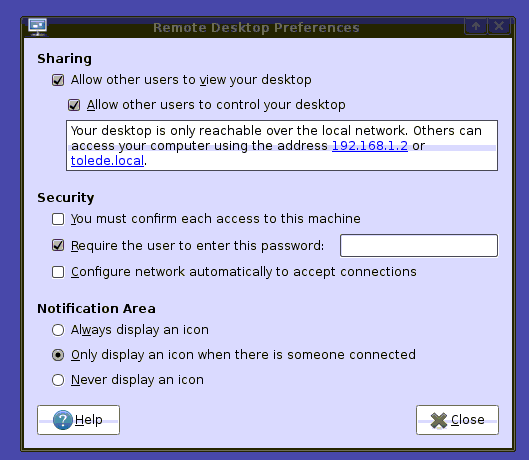 can someone provide a step by step for vnc setup on ubuntu 10.10 desktop. I have ssh access to it at the moment with root user. I tried installing vnc4server package, then after that did a vncpasswd with root and setup a password of 7characters and once of 6characters. Then forwarded vnc ports via ssh tunnels but at first it gave me the prompt to type vnc password and won't accept, now it just won't connect. Which port shall I add in "Source and Destination" in Putty > SSH > Tunnels ? I can successfully ssh but not vnc. will be grateful for your help. Please if you can write the steps down for this scenario, as i have gone through a whole lot of links and its all very confusing. I don't bother with any of the server jazz. I install x11vnc on the remote computer, connect to it by ssh, forwarding back the port and then just connect locally (to the forwarded port). ssh oli@192.168.0.4 -L 5900:localhost:5900 "x11vnc -display :0 -noxdamage"
You can script this to do one then the other. I'd tell you what I do but this is running on my phone and the client is different. I did not see from your description that you started the vnc server. You should have vnc running on your computer. You should create a tunnel that allow you to access it. It's easier if you can test on the network where the machine is installed. Regarding the first part, I personally use vino. There is a quick setup guide for vino. If you can redirect your display, you can make that windows pop on another computer. If not, you'll need to check the vino man page to find out how to make the same configuration . Once you connected to your VNC, I suggest you enter this command in your Autostarted Apps to start vino server. There several tool out there. I used vino because it is the simplest to use (in my knowledge). Regarding the second part of the question. The local port is what ever you feel like. By convention, we try to make the local and remote port the same. You will need to specify the port if you use something different. The remote port is where your server is running. If you are using vino, it's localhost:5900 (unless you configure something else). From another box VNC to this above box. Not the answer you're looking for? Browse other questions tagged 10.10 vnc or ask your own question.